The latest body care range by The Body Shop is their Almond Milk and Honey range which smells sweet and amazing. Their formulas are made suitable for those with dry and sensitive skin and what better way to embrace it with their nourishing products. We shouldn't shy away from our sensitive skin - but instead let's look to celebrate why you should also look to feel happy and confident in your own skin. Fact: Did you know sensitive skin is currently one of the highest global skincare concerns where they have racked up 270,000 Google searches over the past year...? The Body Shop have developed a nourishing skincare range that combines restoring ingredients that are made for those with dry and sensitive skin. 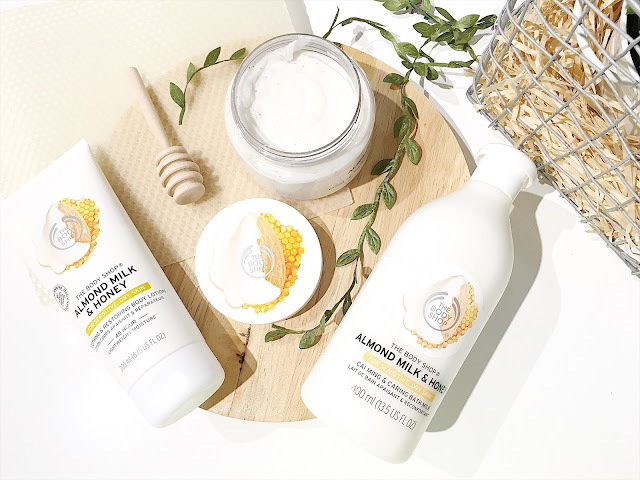 I recently tried out a few of their products from their Almond Milk & Honey range such as the Soothing & Restoring Body Lotion, Gently Exfoliating Cream Scrub and the Calming & Caring Bath Milk. Some of these products come with pleasurable textures and a subtle hypoallergenic fragrance which is ideal for sensitive type of skin. 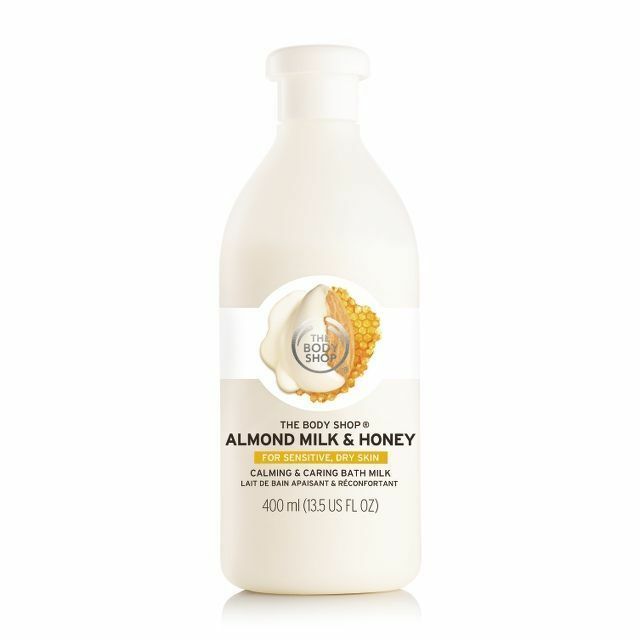 The Calming and Caring Bath Milk is enriched with almond milk from Spain and Community Trade honey from Ethiopia which is very gentle for those with sensitive skin. The milk is 100% vegetarian and 100% cruelty free. This bath milk doesn't leave your skin feeling irritated, but instead - nourished and moisturised. This is a really creamy bath milk which contains a blend of natural oils. I felt that this bath milk allowed my skin to feel more soothing and it helps to reduce the sensation of tight, dry skin. It smells so lush and beautiful where it's the perfect pick-me-up for a morning or evening use. As for the design of its product packaging, it really looks adorable and just like an old fashioned milk bottle. 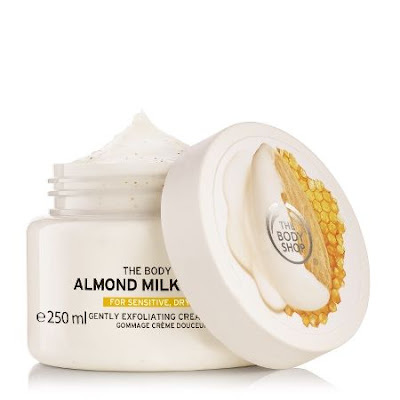 If you're after a gentle and honey-infused cream exfoliating scrub, then you certainly need to check this product out which has been specially formulated for those with sensitive skin. This body scrub works to soothe and smooth out any dry and rough bits on your skin and it looks to buff away all of the dead skin cells. The cream scrub is infused with real crushed almond shells and this helps to leave your skin feeling softer than ever. Once again you cannot go wrong with its scent as it smells so relaxing and rejuvenating. I love how there are no nasties such as colourants, soap, mineral oil and petrolatum - which is better for your skin in the longer run. The product comes in an easy to use pot where you would simply twist the top off to reveal a lovely and creamy texture. Last but not least, I also looked to try out their Soothing and Restoring Body lotion which allows for a 48 hour lightweight moisture. This lotion has been enriched with almond milk from Spain, Community Trade honey from Ethiopia and Community Trade Shea butter from Ghana. This lotion is very creamy and soothing on the skin where it absorbs really quickly and it feels so lightweight. You don't get that heavy feeling on the skin which is ideal because it's not sticky or greasy at all. My skin was feeling very dry due to the cooler weather change and so after using this lotion, it has allowed my skin to feel much smoother and moisturised. It's a really nice lotion to use because of its instant relief in tightness and itchiness of sensitive and dry skin. The product comes in a flip top lid packaging which is so effective and easy to use. I would highly recommend this lotion if you're after a nice and refreshing lotion for sensitive and dry skin. 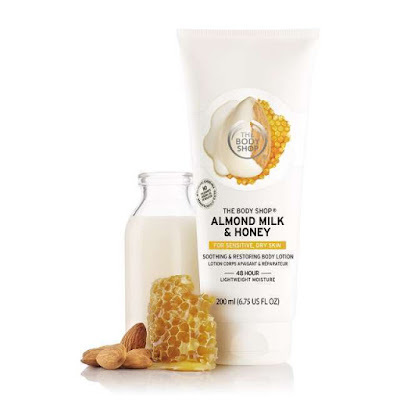 What are your thoughts on the new Almond Milk and Honey range by The Body Shop? Let me know on what you think. Thank you to The Body Shop for supporting me for this review. My reviews are based on my own experiences and I only recommend products that I truly believe in. thanks for sharing these amazingly helpful suggestions, it has been a great help. Keep sharing and caring.